The Nigerian Television Fashion Show is a monthly event to showcase celebrity designers and upcoming designers' new line of fashion. The monthly show, which started three years ago, was the idea of Mr. Steve Ojo, who is also the producer. Catwalk Studio and Modela have since been the two official fashion coordinator and modelling agency . NTFS as it is fondly called has paved way for a lot of designers, both in Lagos and even beyond. It has in a way helped these designers to show the public their creativity on television. A lot is put together to make the show what it is today, especially getting designers that will showcase their designs. Most times, we have an average of nine designers each month, but there have been times we have a crazy month when we are forced to use 11 or more designers, which really can be very tasking as well as tiring. NTFS is a blessing to the fashion and modelling industry. Apart from creating job opportunities for our female and male models, it has created a platform for wannabes to be trained and groomed for the runway, as models, thereby starting their major career in modelling. 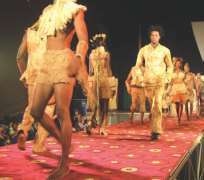 Most of the known and popular faces you see strutting most fashion show runways, showcasing the works of most of our celebrity designers, actually started with us in NTFS. In as much as we have lots and lots of models, I tell you there are models and there are models. I am noted for the Catwalk; and you must be really good before we can let you be on the runway. Casting for the best models is always tedious, fun and sometimes upsetting. Why? Some wannabes will get in your face and tell you they know how to catwalk better than Oluchi and Naomi Campbell and that I don't know jack, yes! Right, I don't know jack because jack has nothing to do with catwalk. These wannabes as they claim, did a show for a designer who probably does not know about putting a show together, or just for cheap labour, decided to use them. To them, that qualifies them as Models. These days, some designers, in trying to cut costs, will not use a professional fashion coordinator to help them put the show together, nor will they make use of professional models. After auditioning of models and getting the month's designers, we start grooming the chosen models for the show. Other people needed to complete the NTFS are the make-up artist, the hair stylist, and the stage manager. Everyone works together, following the theme of the fashion show. Everybody looks forward to the event day of each month of the fashion show. In fact, it is as if we are paid a million naira to do the show but it is because we are all involved in the show. We really have a great passion for what we do, it is really not because of the pay. It is also interesting to see the event hall filled with lovely, well dressed beautiful people, who have come to watch the show and catch as much fun as they can. At the end of every year at NTFS, we celebrate by having our anniversary and award night, where designers, make-up artist, models and all the people that make the industry tick are appreciated. The 2008 Award has been postponed till March 2009, so as to make the event a grand one. We'll keep you posted. In 2008, the fashion shows were fun, creative and inspiring. To all designers that showcased their designs: Modela, JD7, Remi Lagos, Beulah Fashion, Princess, Maris, Big & Beautiful, Zizi, Frank Osodi and all others too numerous to mention, I say, good job and a big thank you to you all. If you are looking for nice styles for a fabric or that Aso-ebi of yours, I advise you watch out for different styles on NTFS.